Can the color of food affect your health? Chinese people believe that we are surrounded by five energy fields or five different kinds of “chi” (氣). These are also called the "five elements" and they play an important role in all aspects of Chinese culture, including the way people eat. This theory states that if these five elements are changed or moved, this could seriously affect a person's fate. The “five elements” (五行) are also known as the five agents, five phases, five movements, five forces, five processes, and five planets. If the concept of yin and yang is the center of the Chinese culture, then the theory of the “five elements” should be treated as its cornerstone. But what exactly are the five elements of Chinese cooking and how do they play a part in Chinese cuisine? The five elements are metal (金), wood (木), water (水), fire (火), and earth (土). Chinese people use this five elements theory for a lot of things, from the interaction between internal organs to politics, and Chinese medicine to cooking and food. Earth contained and bore Metal. Metal improved the quality of the Water. Water helps the Wood grow. Earth can stop the Water. Water can stop a Fire. To give an example from nature, a plant (wood) grows when it is given water. When burnt, wood gives birth to fire, and the burnt ashes subsequently return to the earth. Chinese herbalists and doctors believe that to properly treat a patient, you must know the state of the five elements in their body. Any deficiency or an excess of an element can lead to illness. The five elements also represent our five main organs: lung (metal), liver (wood), kidney (water), heart (fire), and spleen (earth). The five elements also represent five different colors: white (metal), green (wood), black/blue (water), red (fire), and yellow (earth). 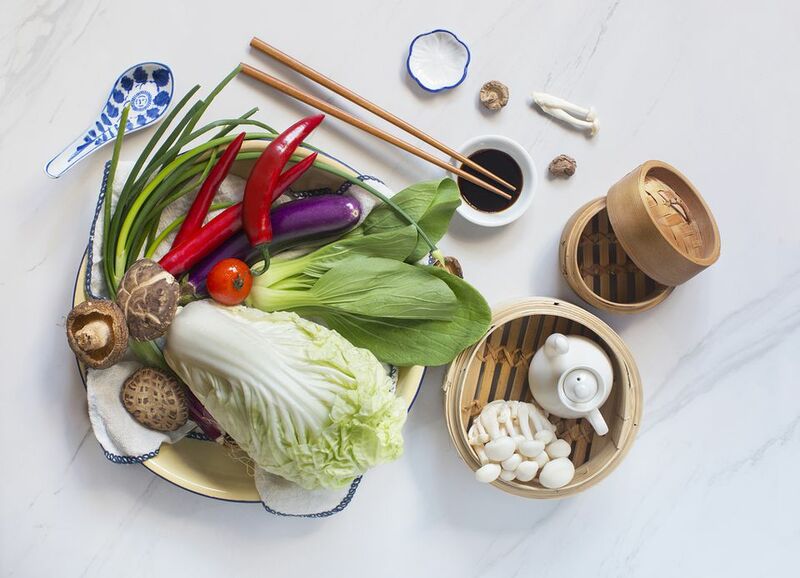 In Chinese medicine and cooking, it’s believed that if you are weak or ill in certain parts of your body or organs, you should consume certain colors/elements of food to help you feel better and improve your health. For example, if you have health problems with your kidney, you should eat more food that’s black/water in color, such as wood ear, seaweed, and black sesame. Chinese people believe consuming food that is red in color is good for your heart, small intestine, and brain. Foods that fall into this category include carrots, tomato, sweet potato, strawberry, chili, red beans, red pepper, jujube, goji berry, dragon fruit, apple, brown sugar, and anything else that is a shade of red. If you consume green-colored food, it’s good for your liver, gallbladder, eyes, muscle, and joints. The list of green foods could be endless. Some of the main ingredients used in Chinese food include mung bean, Chinese leeks, wasabi, and all the green vegetables and fruits. According to this theory, yellow food is good for your digestive system and spleen. Again, yellow is a common color in food. You can eat things like sweet or baby corn, yellow sweet potato, taro, oats, pumpkin, butternut squash, yellow pepper, soybeans, egg yolk, bean curd, ginger, orange, star fruit, lemon, pineapple, papaya, peanut, walnut, honey, and more. If you eat white-colored food, it is supposed to benefit your lungs, large intestine, nose and respiratory system, and skin. Black and blue foods are reportedly good for your kidneys, bones, ears, and reproductive organs. Black or dark blue foods aren't as numerous, but the list includes some great options. Look for ingredients like wood ear, seaweed, shiitake mushrooms, eggplant, black beans, raisins, blueberry, black grapes, black sesame, black vinegar, tea, sweet bean sauce, and more. Please note, eating a balanced diet is very important. This article is simply intended to introduce you to the five elements theory as it's reflected in Chinese food. It is not designed to be a magic cure-all for anything that ails you. If you have any health issues, it is important to consult your doctor or a nutritionist before you take on any specific diet.